G-loves. No, that is not a typo. It is the name of my new favorite accessory. G-loves. They’re like stylized gloves on crack. Technically, they’re for weight lifters. They’re designed with padding on the palms to keep women from getting calluses on their hands when lifting weights. One of the terrible side-effects of wheeling around is that my hands take quite a beating. My palms get rough and dry. The side of my thumbs have permanent marks from where the tire rubs when wheeling. I could save my thumbs by having my handrims farther out, but then my wheelchair would be wider and I’d have more of a difficult time getting through doorways. In this business, you have give and take. Roughed up hands versus getting through doorways. The other problem I was encountering was that my hands were getting sweaty when I was walking at PT. The good news there is that I am pushing myself really hard and the dripping sweat is indicative of that. The bad news is that when the hands get slippery, I’d have to stop. 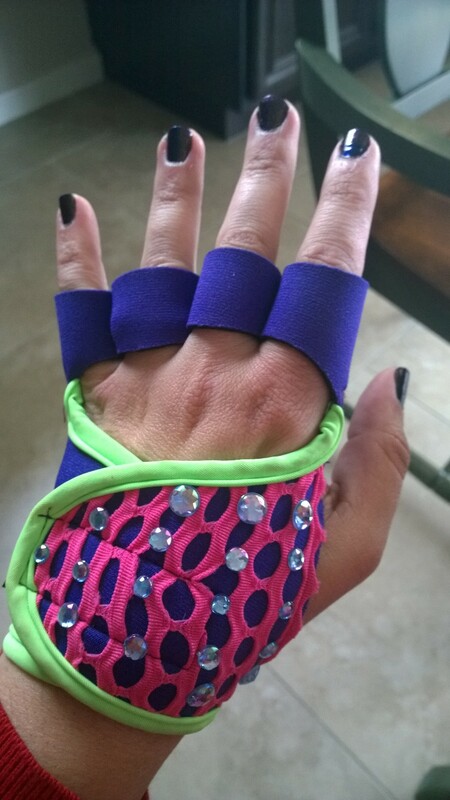 Now with these gloves, I can walk longer without fear that my hands are going to interfere. They maintain a good grip throughout. And, don’t worry, they’re washable. I don’t remember exactly how I stumbled across the G-loves, but I am so glad I did! They have so many different color combinations to choose from. Of course, I ordered the most outrageous color I could! No one has ever accused me of being afraid of color. And being a true 80’s child, I was immediately drawn to the Rad collection. And, as if they weren’t amazing enough, I ended up bedazzling them when I got them. I bought a second pair from the Wave collection, because it looks like shiny mermaid scales on my hand. (Mermaid scales sounds way prettier than fish scales, right??) For the record: I decided those were shiny enough and did not bedazzle them. A sizing tip for anyone interested: I have pretty normal-sized hands (read: proportionate to my body). They measure a circumference of 7.5″. I went by their size scale and ordered a small, which are really snug. I was worried about getting them too big, and then sliding around inside. But, if I had to reorder, I would go with a medium. Or, I should say, when I do reorder, I will get a size medium. For more information on G-loves, click here.